What is the situation with the baby songbird? Mother is known to be dead. Nest fell or nest removed. Tree cut down. On the ground. Out of nest. Inappropriate location. 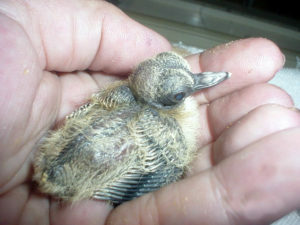 Note on Mourning Doves: does your baby look like this?